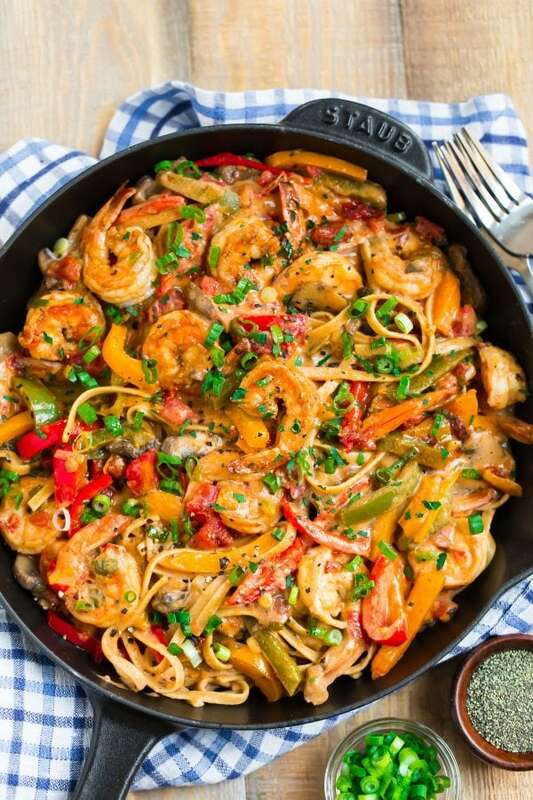 Time to get sassy, healthy Cajun Shrimp Pasta style! 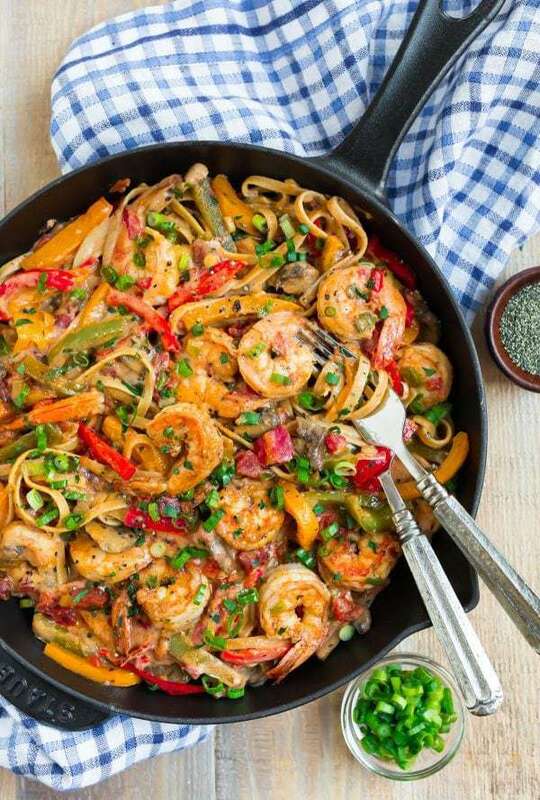 Whole wheat noodles tossed in a lightly spicy, creamy sauce, then loaded up with juicy sautéed shrimp and veggies, this slimmed-down recipe is ready in 30 and will have you dancing around your kitchen like you’re in downtown New Orleans. This Cajun Shrimp Pasta is inspired by one of my go-to menu items at a well-loved restaurant of my childhood, Chili’s. When we were younger, my parents would take us to this all-American eatery on weekends when everyone was antsy to get out of the house. Crayons and tic-tac-toe for my sisters and me. Margaritas for mom and dad. Later on, my high school friends and I would meet up sans parents for what we considered to be very “grown-up” dinners. At some point in between these two life phases, I graduated to the adult side of the menu. Cajun Shrimp Pasta was one of my go-to orders. Spicy blackened shrimp cooked in a thick alfredo sauce, it was indulgent, heavy on the penne, light on the veggies, and exactly that sort of thing that high school Erin craved. Nowadays, I still love myself a rich, creamy plate of pasta now and then (unless it’s cold outside, or I had a bad day, or pasta just sounds delicious, in which case I crave it now and now), but my expectations are higher. Yours should be too! Let’s make Cajun Shrimp Pasta tasty and better for you, without losing its indulgent appeal. High school me is all about the creamy sauce. Grown-up me is glad that I can have a big ol’ serving without the feelings of regret. Whole Wheat Pasta. Trading out white pasta noodles for their whole-grain counterpart instantly boosts your intake of fiber, protein, and other nutrients. The classic Chili’s recipe is for a Cajun shrimp pasta penne. I like a longer noodle with creamy alfredo-style sauces like this (personal preference), so I traded the penne shape for linguine. Use any shape of noodle you like! The important thing is that it is whole wheat. Reduced-Fat Cream Cheese. This is a creamy Cajun Shrimp Pasta with no cream! Just four ounces of light cream cheese are all you need for a sauce that tastes thick and creamy like alfredo, for a fraction of the calories. Bell Peppers. Crisp and colorful, bell peppers are a staple ingredient in Cajun cooking and make this pasta an all-in-one healthy dinner. I love my pasta heavier on the veggies, so you’ll score bell peppers with every twirl of your fork. Mushrooms. OK FINE. You caught me. The original Chili’s version of this pasta does not contain mushrooms, and they are not traditional in the slightest, but they taste super delish in the Cajun Shrimp Pasta. If you aren’t into them, you can leave them out or swap another bell pepper. Canned Fire-Roasted Diced Tomatoes. To make this Cajun Shrimp Pasta taste like Chili’s! I keep several of these cans in my pantry at all times to add instant flavor (and extra veggies!) to my meals. Cajun Seasoning. A blend of spices, Cajun seasoning (along with a good-measure pinch of cayenne) gives this pasta its signature flavor. You can find Cajun seasoning in many grocery stores and online. If you’d like to make your own, check out Ali’s homemade Cajun seasoning recipe. Note that Cajun seasoning contains salt, so depending upon how much you choose add to this recipe (more seasoning = more spicy), you’ll want to adjust the amount of salt in your pasta accordingly. And the final ingredient we need to discuss, shrimp! I adore shrimp for quick dinners, because they cook in only a few minutes. It’s why they’re often my choice for healthy pasta recipes like this Garlic Shrimp Pasta, Spicy Shrimp Pasta, and Healthy Shrimp Scampi. For the fastest cook time, look for shrimp that are already peel and deveined (or at least deveined and easy peel). The best shrimp are often in the freezer case. Usually what’s behind the seafood case was previously frozen anyway, so you can often get a better deal purchasing frozen shrimp, then letting them thaw overnight in the refrigerator. Forget to thaw overnight? Put your frozen shrimp in a colander and rinse them with lukewarm water. If you’re not into shrimp, you can replace the shrimp with sautéed bite-size pieces of boneless, skinless chicken breasts or thighs. For a gluten-free version, use gluten-free noodles. I recommend rinsing them with water after they cook to keep them from becoming gummy. For a vegetarian version, omit the shrimp. Swap extra mushrooms or peppers. 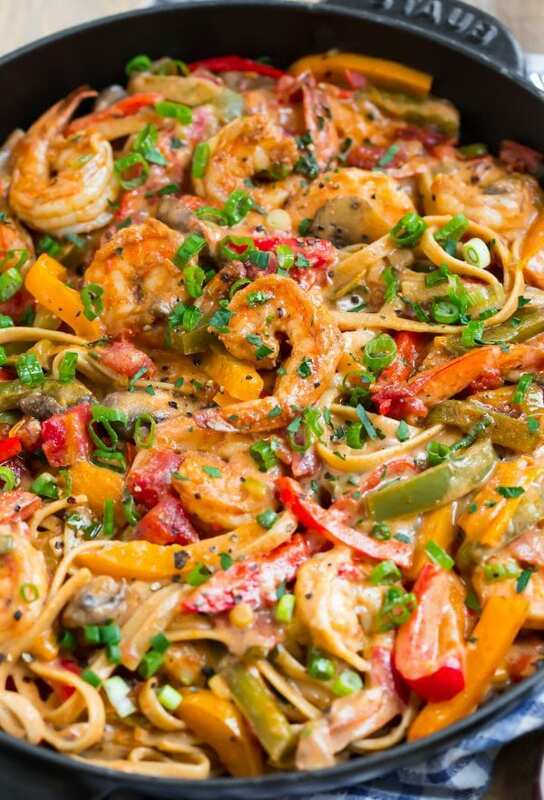 For extra veggies, turn this recipe into Cajun Shrimp Pasta with Spinach! Stir in a few handfuls of spinach at the very end, allowing the heat of the pasta to wilt it. As the recipe is written, this pasta has a kick but certainly won’t set off alarm bells if you are accustomed to spice. The creamy sauce helps to cool it down. If you’d like the pasta hotter, feel free to add additional Cajun seasoning and/or cayenne until it’s as spicy as you care to dare. Creamy Cajun Shrimp Pasta. Juicy shrimp and veggies in a lightly spicy, creamy alfredo sauce. Made healthy with everyday ingredients, easy, and delicious! Bring a large pot of salted water to a boil. Prepare pasta according to the package instructions for al dente. Heat the oil in a large, deep skillet or dutch oven over medium-high heat. Place the shrimp in a bowl and sprinkle with 1 teaspoon Cajun seasoning, 1/4 teaspoon garlic powder, 1/4 teaspoon kosher salt, and 1/8 teaspoon black pepper. Toss to coat. Once the oil is hot but not yet smoking, add the shrimp and cook just until they turn from gray to pink, are lightly firm, and fully cooked through, about 3 to 5 minutes. (Be careful not to overcook!) With a slotted spoon, immediately remove them to a large plate or large bowl. Reduce the skillet heat to medium. Heat 1 tablespoon butter over medium heat. Add the red, orange, and green bell peppers. Cook 3 minutes, then add the mushrooms and sprinkle with 1 teaspoon Cajun seasoning and the remaining 1/4 teaspoon garlic powder, 1/2 teaspoon kosher salt, and 1/8 teaspoon black pepper. Sauté until the mushrooms are tender and have given off their liquid, about 5 additional minutes. Add the tomatoes and cook until most of their liquid has cooked off, about 3 minutes. Add two-thirds of the green onions. With a large spoon, scoop up the vegetables into the plate or bowl with the shrimp. In a large liquid measuring cup, whisk together the milk and cornstarch until well combined. Grab a whisk and heat the final 1 tablespoon butter over medium. Pour in the milk mixture and whisk until smooth. Add the cream cheese in small pieces. (I usually tear and drop it right in with my fingers.) Whisk constantly and bring the mixture to a steady (but not violent) simmer, and cook for 2 to 3 minutes until the sauce is slightly thickened, whisking all the while so that you have a smooth, creamy sauce. Stir in the final 1 teaspoon Cajun seasoning. Return the vegetables and shrimp to the skillet. If there are a lot of juices that have collected in the bottom of the bowl, you can choose to add it if you want a thinner sauce or omit it if you prefer a thicker sauce. Drain the noodles and add them to skillet. With a long pair of tongs, toss to fully combine and coat every bit with that yummy, creamy sauce. Taste and adjust salt, pepper, and Cajun seasoning to taste. Sprinkle with remaining green onions. Serve hot. *For the speediest possible prep, purchase peeled and deveined shrimp. (Easy-peel and deveined would also work.) I buy frozen and let them thaw overnight in the refrigerator. Tails on or off is your preference. This looks DELISH….can I sub chicken for the shrimp and not have to change anything else about the recipe? Hi Kisha, I think that should work (although I haven’t tried it myself). The chicken pieces will need to cook longer than the shrimp, and you can always taste for seasoning at the end and adjust as needed. I hope you enjoy! Looks delicious! I remember there was a creamy pasta dish at Olive Garden that had artichokes and mushrooms in it that was my go-to “adult” dish when I was a freshman in college, because artichokes seemed so exotic to me at the time. I’ll have to dig up that recipe one day and see if there’s a lighter version of it. Artichokes totally seem grown up, Deb! I hope you find a good recipe. Can’t wait to try this, I’ll make it this week! I hope you love it, Emily! 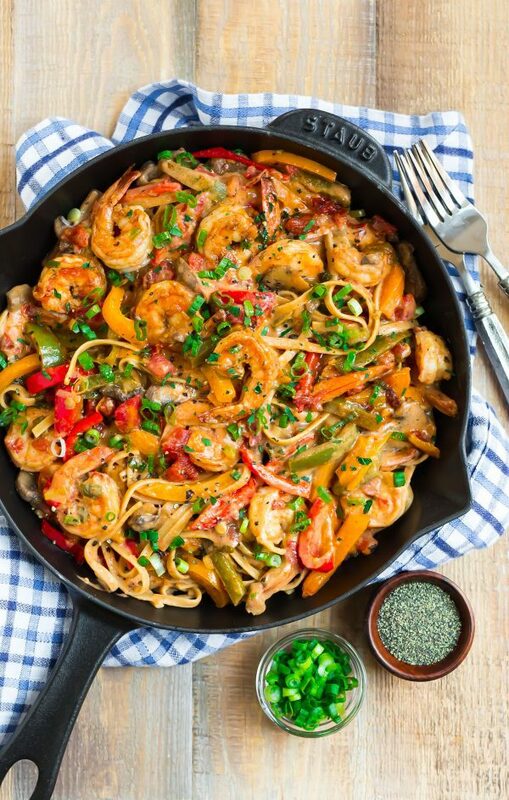 Love how you put cajun inspired flavours into a pasta dish!! Looks incredible! Thanks so much! I think the flavors work really well! This sounds SO GOOD! I cannot wait to make this! Thanks for your recipe. The photos just about have me drooling. Thank you, Peggy! I hope you love the pasta if you decide to try it! I never tried the Chili’s version because high school me was too busy drilling bacon cheeseburgers & strawberry lemonade, but this is soooo good. I substituted bow tie for linguine because it was the only whole wheat pasta I could find. DELICIOUS!